[Lauber] was walking around the all-boys school with bleached-blond hair that draped over one eye, and Romney wasn’t having it. “He can’t look like that. That’s wrong. 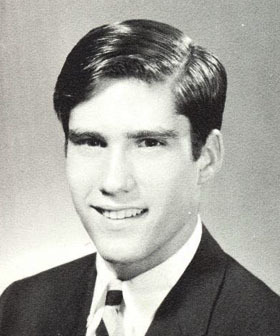 Just look at him!” an incensed Romney told Matthew Friedemann…A few days later, Friedemann entered Stevens Hall off the school’s collegiate quad to find Romney marching out of his own room ahead of a prep school posse shouting about their plan to cut Lauber’s hair. Friedemann followed them to a nearby room where they came upon Lauber, tackled him and pinned him to the ground. As Lauber, his eyes filling with tears, screamed for help, Romney repeatedly clipped his hair with a pair of scissors. Does this matter? It was 50 years ago and a different era. And generally speaking, I’ve always felt like there ought to be a political statute of limitations on this kind of thing: Anything that happened before, say, age 25 and more than 20 years ago is off limits. Needless to say, though, that’s decidedly not the way the world actually works, and in the case of presidents their pasts have always been fair game back to the day they entered kindergarten. Like it or not, Romney isn’t being treated any differently here than any other presidential candidate of the past half century. Whether he wants to do those things because deep down in his soul he’s a cruel person and always has been, or because he’s perfectly kind to the people he meets but believes in an ideology that is fundamentally cruel, doesn’t matter a bit. He’s not asking us to elect him hall prefect, he’s asking us to elect him president. This story is certainly colorful and interesting, but it shouldn’t change what we think about Mitt Romney as a candidate. The story does give the sense of a man who lacks a natural sense of compassion for the weak. His prankery seems to have invariably singled out the vulnerable—the gay classmate, the nearly blind teacher, the nervous day student racing back to campus. It’s entirely possible to grow out of that youthful mentality—to learn to step out of your own perspective, to develop an appreciation for the difficulties faced by those not born with Romney’s many blessings. I’m just not sure he ever has. And me? I think mining the past for clues to people’s character is basically okay as long as you don’t engage in endless pretzel bending to draw absurd conclusions. Barack Obama’s youthful drug use and his community activism say something about him, so they’re fair game. Pretending he’s a whitey-hating anti-colonialist because of imagined influences from his Kenyan father isn’t. In Romney’s case, describing how he treated both friends and nonfriends while he was growing up is fair game. It’s partly a window into Romney, and partly a window into the era and culture that he grew up in. But pretending that this makes him an anti-gay bully today isn’t. He’s got decades of adult experiences that tell us what kind of man he’s become. That should be enough.